Probably no election this year has been more important to the presidential politics of 2016 than Republican Gov. Chris Christie’s landslide 60% reelection victory in Democratic-leaning New Jersey. It cemented his place in the front ranks of Republican presidential contenders by demonstrating his vote-getting appeal to constituencies that the GOP covets. 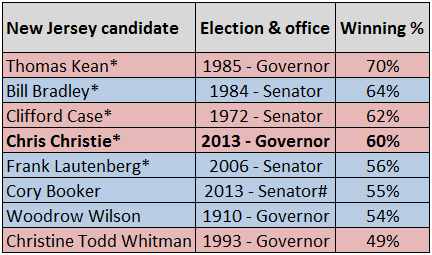 A few past presidents have done better in their midterm “auditions” than Christie. Two years before he was elected president in 1960, John F. Kennedy was reelected in Massachusetts to the Senate with nearly three-quarters of the vote. Two years prior to his successful White House run in 2000, George W. Bush won another term as governor of Texas with more than two-thirds of the vote. But neither had to run on more problematic terrain than Christie. New Jersey is reliably Democratic at the presidential level and has not elected a Republican senator since 1972. To be sure, he drew an under-funded Democratic challenger in state Sen. Barbara Buono, who complained of abandonment by her party. But her plight was as much a tribute to the incumbent’s strength as anything else. For a candidate such as Christie, who emphasizes electability over ideology, a solid midterm showing can be a key ingredient in fashioning a winning path to his party’s presidential nomination two (or in this case, three) years later. On the other hand, a close win in the midterm election cycle can throw a potential presidential candidate’s vote-getting ability into doubt. And an outright loss, such as that suffered by Sen. George Allen (R-VA) in 2006, can knock a potential White House aspirant from consideration altogether. Since World War II, a half-dozen politicians have used decisive, even historic, midterm wins to launch successful bids for their party’s presidential nomination two years later. In 1946, Republican Thomas E. Dewey was reelected governor of New York with 57% of the vote. It was a higher share than Theodore Roosevelt, Al Smith or Franklin D. Roosevelt ever drew when they were elected governor of the Empire State. In 1958, Democrat John F. Kennedy took 73% of the vote against a little-known Republican opponent, the largest Senate win in Massachusetts up to that time. In 1986, Democrat Michael Dukakis was reelected governor of Massachusetts with 69%, the highest share for a gubernatorial winner in the Bay State in more than a century. In 2002, two years before his presidential nomination, Democrat John Kerry won reelection to the Senate in Massachusetts with a thumping 80% of the vote, albeit without facing any major-party opposition. However, Bill Clinton’s gubernatorial reelection in 1990 was something quite different from the others. To put it charitably, it could hardly be described as a springboard to the White House. Running a sixth time for governor of Arkansas in 12 years, he drew both primary and general election opposition. His Democratic opponent, Tom McRae, did not have much money but clearly irritated the Clintons. One of the challenger’s ads featured a line of clocks stretching off into the distance, a reference to Clinton’s long-running and seemingly never-ending governorship. At one McRae press conference, Hillary showed up and essentially heckled her husband’s opponent. Clinton won the Democratic primary with a modest 55% of the vote. In the general election, the incumbent suffered a self-inflicted wound. When asked if he would serve out his next term as governor if he were reelected, Clinton said yes, seemingly shutting the door to a 1992 presidential campaign. After winning reelection with 57% of the vote, six points lower than his previous gubernatorial race, Clinton had to go around the state meeting with supporters and basically asking them to let him off the hook. Other postwar presidential nominees have not had to surmount the midterm hurdle with its various risks and rewards. They were sitting presidents, vice presidents, elected officials who were not up for election in the midterm cycle prior to their presidential run or were out of elected office altogether. The prospective lineup of White House aspirants for 2016 reflects this eclectic mix. On the Democratic side, there is a vice president (Joe Biden), a former senator and secretary of state (Hillary Clinton), an outgoing governor (Maryland’s Martin O’Malley) and a sitting governor (Andrew Cuomo of New York). Of this group, only Cuomo would be on the ballot in 2014. On the Republican side, there is a mix of governors and members of Congress gaining White House mention. Some — such as Govs. Scott Walker of Wisconsin, John Kasich of Ohio and Rep. Paul Ryan of Wisconsin — will be running for reelection next year. Others — such as Sens. Ted Cruz of Texas, Rand Paul of Kentucky and Marco Rubio of Florida — will not be. But the latter can make a mark in 2014 by campaigning for GOP candidates and contributing liberally to their campaigns. And there may be others next year who attract presidential speculation on the basis of a particularly impressive midterm showing. But Christie is already in the clubhouse, so to speak, with his big 2013 victory in hand. He succeeded with an appealing (to many) combination of “in your face” swagger and bipartisan outreach, which reached its public apex in last year’s election-eve embrace of President Barack Obama in the wake of Hurricane Sandy. The Christie-Obama relationship has caused some gnashing of teeth within Republican ranks, and has been blamed by some for contributing to the GOP’s presidential defeat in 2012. But it proved no problem for the New Jersey governor in his home state, where exit polls last month showed Christie winning the vote of nearly three-fourths of Catholics, almost two-thirds of independents, a majority of women and Hispanics and fully 20% of African Americans. In short, Christie’s triumph was an example of “big tent” Republicanism, something that many in the leadership of the party are more than ready to return to nationally. Chris Christie’s 60% reelection victory last month was not the highest vote share ever recorded in a New Jersey gubernatorial election. Three previous winners, led by Republican Thomas Kean in 1985, amassed higher percentages. But Christie’s 2013 vote share was larger than Barack Obama garnered in his two presidential runs in New Jersey (57% in 2008, 58% in 2012) and higher than the 54% that Woodrow Wilson drew in his 1910 gubernatorial contest (the lone time that he ran for the office). Wilson was the only Garden State governor thus far to be elected president. Note: An asterisk (*) indicates an incumbent; a pound sign (#) denotes that Cory Booker won a special Senate election in October 2013. Vote percentages are based on total votes cast in the particular election. Sources: America Votes 30 (CQ Press/Sage Publishing); Congressional Quarterly’s Guide to U.S. Elections, Volume II.